Posted in: Celluloid, Giggles and Grins. Because school has officially started and because I have jack and squat for time, I’m bringing back one of the first posts I made on my blog from 1999. This time, though, with comments, you get a chance to tell me what you’re all time favorite movies are. My next weekly Top Ten List. Honorable mentions: Army of Darkness, Cloud Atlas, The Full Monty, Alien, The Bridge over the River Kwai, The Good, the Bad and the Ugly, Jaws, The Fisher King, The Great Escape, Terminator 2, Raise the Red Lantern, the Adventures of Baron Munchausen, Star Wars, Vertigo, Platoon (previously on list bumped by Mad Max: Fury Road), The Lord of the Rings (previously on the list bumped by Amelie), Rashomon (previously on the list bumped by Let the Right One In). The only one actually in order are the first two. Seven Samurai and Raiders are my favorite movie of all time. And, to qualify, these movies are all personal choices for me. They have had, in some shape or form, a profound effect on how I work as an artist and as a individual. Take it for what it’s worth. First take a good look at the picture on the right, then come back and finish reading. Remember, at its core Hollywood isn’t about creating art or great films or spreading political messages or taking up various causes (they can, of course, do any of these, it’s just not there core drive). Hollywood is driven by one thing and one thing only. Money. So there is no one to blame – not even Adam Sandler – but each individual who goes to a movie and pays for it. Because that is the loudest voice Hollywood hears. So until [insert whatever demographic suits you] makes money don’t expect it to see equality on the big screen. Think about it, in the last 10 years what is the largest demographic growth for movies? Teenagers. And now we’re seeing a rash of Young Adult novels turned into films. And they make a heck of a lot of money. One interesting side effect of this is to see what happens with women’s roles over the next decade. Because most of the truly successful YA films have lead females I’m willing to bet this is going to effect the number of female leads carrying films. The people that jump on a cause and want to claim that Hollywood must change its time to diversity or whatever are trying to cure the problem where it doesn’t exist. Hollywood doesn’t care. It doesn’t have an agenda for equality or ANYTHING except as a business to make money. If you want to see more movies in other arenas (i.e. demographics) than either stick to indie films (which are often much better anyway) or convince the public to want something else. That is the only way Hollywood will listen, because as a smart business they work on the idea of supply and demand. If the public isn’t demanding they aren’t going to supply it. Tyler Perry is a great showcase for this. How many of his films have a caucasian actor playing the main character? Why? Is it because he hates white people? Of course not, it’s because he understands his market and he markets his films to them. So why does everybody want to tell Hollywood how to choose their markets? I am not a fan of Adam Sandler films. I don’t find them funny and I find them often painful to sit through. That statistic above blew my mind. I honestly didn’t understand how he keeps making movies because I hear a lot of people say they don’t like Adam Sandler films. In one line, that photo answered my question. 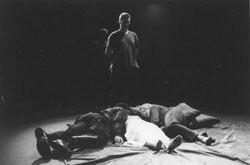 About a decade ago I had the wonderful opportunity to play Iago, in a production of Shakespeare’s Othello. I’m also an avid film lover and a filmmaker. What do these two things have in common? Well, there’s a certain ‘movement’ in film over the last few years (and before anyone reminds me of other times this has happened I’m well aware this has happened before but since it’s happening ‘again’ now, I thought I’d use it as an example.) The movement is this idea of ‘re-imagining’ villainous characters from other films/books/plays/fairytales/comics. I recently saw one with the evil queen in Snow White and the Huntsman.There’s another coming out later this year focusing on the evil queen from Sleeping Beauty. In comics it’s been going on even longer – somewhere in the late 80s characters like Magneto, the Punisher, Kraven and other’s began to get ‘back stories’. In science fiction it happened with the Borg in Star Trek. In fantasy literature (and Dungeons and Dragons mythos) it happened with the Drow. If I’m not mistaken there’s a whole cannon of books written by someone re-imagining the wicked witch of the west. It all comes back to Iago. While working on the production I had several discussions with the director about the need to get the cast to ‘buy’ into the idea that he was ‘honest’ Iago (a term that almost everyone in the play calls him.) Because if they didn’t the audience wouldn’t. And this was a setup for the question that I struggled with the most: why did Iago do what he did? He mentions several things about his past through the course of the play but given that he is constantly lying and manipulating people it’s hard to take anything he says to be true. But it doesn’t matter. Iago does what he does because he is evil. Today in modern psychology we want to have a reason. He had a broken home. She was beaten as a little girl. But in literature, and what makes great stories great (I’m pretty confident in saying Shakespeare knew what he was doing), is that sometimes evil just is. And I think Shakespeare did this purposefully with Iago. He’s the only villainous character in Shakespeare’s cannon who goes un-punished. Macbeth is beheaded. Richard III is killed in battle. Edgar is killed at the last. Even Malvolio is caught, humiliated and carted of to be banished. Only Aaron the Moor (who some consider a precursor to Iago) is alive with punishment forthcoming at the end, but even he begs for mercy and repents. At the end of Othello, Iago has been told to look on everything he’s done and repent and tell them why he’s done this. Then he utters his last line “Demand me nothing: what you know, you know: From this time forth I never will speak word.” That’s where his motives are all laid out. We’ve all witnessed it. We know. There is nothing else to say. So for my tastes, not all villains need to be diagnosed. Telling me the wicked witch of the west came from a broken home might make for an interesting story but I don’t think it will. And treading to vigorously on something like that may very well kill the sense of wonder I had as a five year old watching Dorothy, the Lion, the Scarecrow, the Tinman, and Toto the Wonder Dog battle the horrible, EVIL, wicked witch of the west. Because now she’s not just evil anymore. She has feelings. And her mommy was really mean to her and I’m supposed to feel bad for her now. Bad Toto. Bad Scarecrow. I can watch movies that have moral dilemmas about who’s right and who’s more right any time I want. I get it. I enjoy them just as much as the next person. And yes, I know we think we know more about the human psyche now and we, supposedly, have better insight into a great number of things. I also understand that I can just avoid going to this films. But every once in awhile I like to just sit down and watch something where I know right off the bat who the good guy is and who the bad guy is. Oftentimes that comes from a character that is already well established. I can guarantee the first time a cowboy in a white hat turned out to be the bad guy there were a lot of angry film goers. And if anyone EVER tries to make a movie with Indiana Jones being the bad guy I will make a personal house call. So, when you go see Angelina Jolie later this year as Maleficent, stop for a minute. Maybe she’s just evil. ADDENDUM: I realized recently the perfect example of how a backstory can ruin something already wonderful. Two words. Darth Vader.